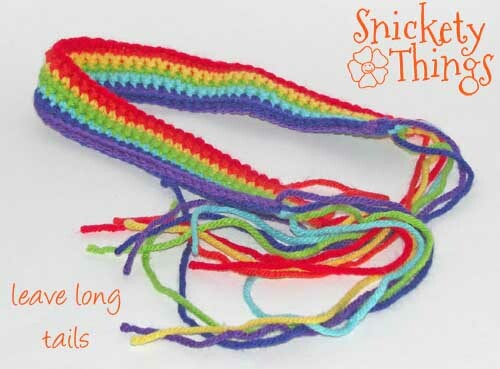 I still have a lot of the yarn left in the rainbow colors and Boo keeps asking if I can make her this or that. 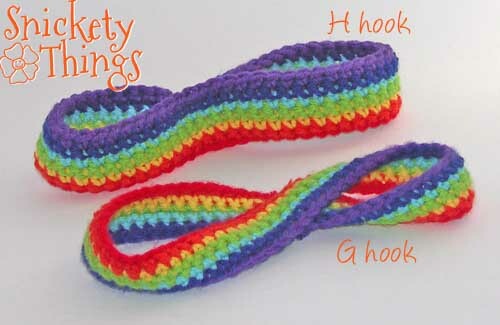 I have been working on a few things for her, but one of the easiest I have done is a rainbow headband. I've actually made two of them, one for Boo and one for the Princess. Here are the patterns I used for each headband. Note: I made one with a G hook and it was a bit snug. I used the same yarn, pattern and an H hook and it was much better. The G hook fit Boo snugly (age 5) and the H hook fit the Princess loosely (age 7) and me slightly snug. 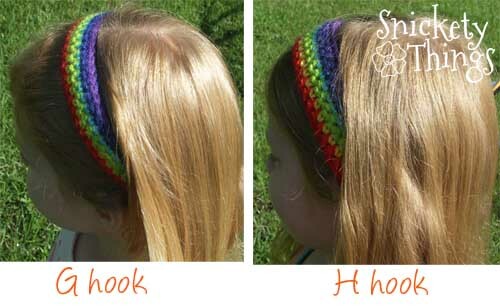 Leave long tails at the ends of each color on both headbands. Yarn used was I Love This Yarn! from Hobby Lobby. Row 1: sc in second ch from hook and in each ch after, work color 3 into last sc, ch 1. Row 6: sl st in first ch from hook and each hook across. Finish off. This leaves the red and violet rows capping the edges without being thicker like the sc rows. This was because a majority of each color gets covered by the next color and only a little shows. Rows 2-6: repeat row 1 with colors 3-7) finish off last sc. I had intended on making the violet row of this headband narrow like the first I just got carried away crocheting. To finish off both headbands, choose which side you would like to be the outside (on G band the one with more violet and red). 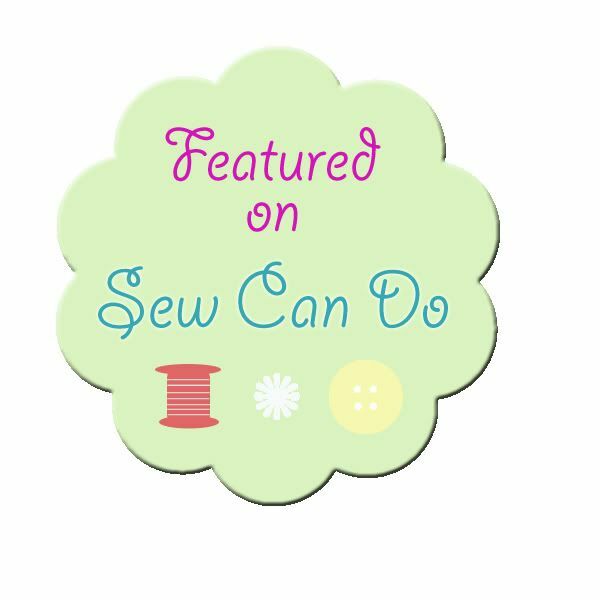 Fold the outside of the band in and carefully tie each tail to its matching color yarn in good knots. This will create a bit of a seam so just make sure it is under the hair. Apply a bit of glue to each knot if desired. Mine have not come undone without glue though. Flip headband to be right side out. Here they are on the girls. I hope you enjoy your headband if you make it. Please, personal use only. I hope to have another rainbow accessory for you next Friday so stay tuned. These headbands are super cute! You will just have to make friends with someone with little girls. I have a Star Wars lightsaber zipper pull pattern I posted a while back. Maybe you can do it. This is too cute! My daughter is just learning to crochet and this would be a perfect project for her to make and to wear! Thanks for sharing! Thanks you! Tell her I said good luck! 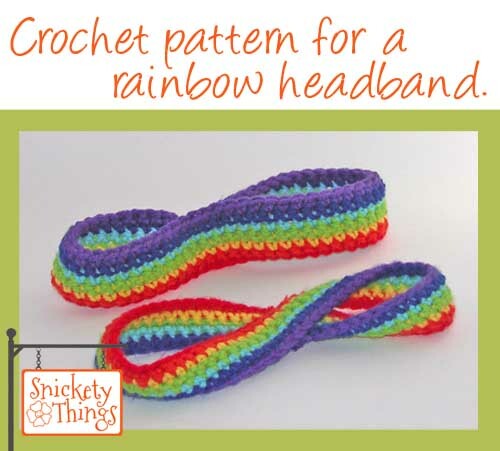 I am always looking for a quick, portable crochet pattern. This project will be perfect to use up my stash of end of skeins. Thanks for posting. Very cute. Everytime I see crochet, it reminds me of my grandmother. Thank you. My grandmother taught me to crochet. It is very comforting when I am stressed. Thank you Stephanie! I constantly try to make new things. Some work and some don't, but I keep trying. Thanks for stopping by!